Information leaflet for 1985 Lesbian and Gay Pride in Cork. Contact details for Cork Lesbian Line, Gay Information Cork and a P.O. Box number. 4 page leaflet for Cork Lesbian and Gay Pride Week (undated but probably 1984). Outlines situation for lesbians and gay men in Cork and the actions of the Cork LGBT organisations. 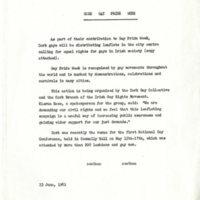 Notice of plan to distribute leaflets in Cork city centre as part of the 1981 Gay Pride Week. The action was organised by the Cork Gay Collective and the Cork Branch of the Irish Gay Rights Movement. First Cork Pride 1981. Doubled sided leaflet produced demanding gay rights. 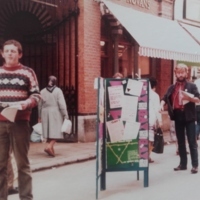 Photographs showing Arthur Leahy and Tony O Regan leafleting outside English Market on Princes Street in Cork.